A 1999 reissue of the album by Toshiba-EMI in Japan reinstated the three-disc format from the original LP issue. This coincided with a new remastering of the album from the source tapes, which greatly improved the sound quality of the album. As of 2008, this remastered set has not been issued anywhere other than Japan. The tour came upon the heels of two Wings album releases: Venus and Mars and Wings at the Speed of Sound. Both were described as “stadium rock” type albums, and the songs from both were heavily represented on the tour, as were numbers from the popular and critically acclaimed Band on the Run. To emphasize that Wings was a real band and not just a McCartney showcase, Denny Laine sang several lead vocals, including “Go Now”, reprising his vocal on The Moody Blues’ first hit from 1965, and Simon & Garfunkel’s 1966 song “Richard Cory”. Jimmy McCulloch also sang lead on his song “Medicine Jar”. Most noteworthy was McCartney’s decision to do a minimal sampling of five of his own Beatles songs – despite an earlier disinclination to do any at all. Performances of “Yesterday” and “The Long and Winding Road” used muted horn arrangements and not their original strings, in the latter case vividly emphasising McCartney’s strong objections to Phil Spector’s heavy-handed strings treatment on the Let It Be album. 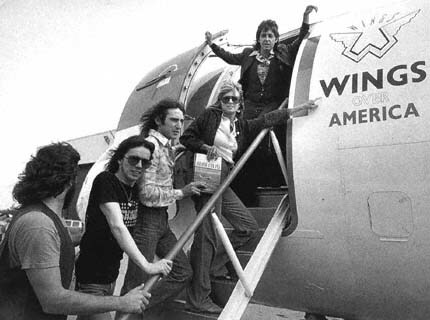 Wings’ lineup for the tour was Paul and Linda McCartney, Joe English, Denny Laine, and Jimmy McCulloch. They were joined by brass and woodwind players Howie Casey, Steve Howard, Thaddeus Richard, and Tony Dorsey. 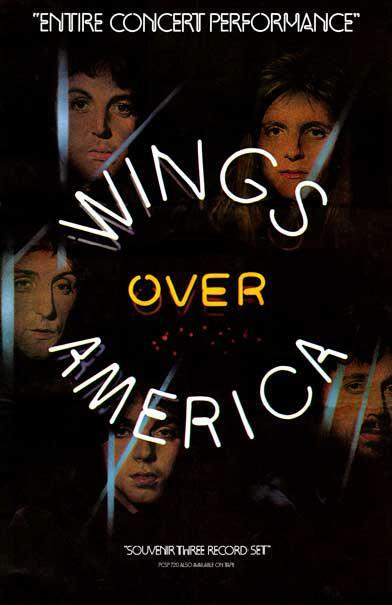 For the tour, the graphic design firm Hipgnosis, who worked with Wings then, created a memorable group logo featuring a stylized letter “W” with a set of wings, and the logo continued to be associated with Wings even after the tour. More than 600,000 people attended 31 shows in the United States and Canada. In order to cut the stress of moving their young family around the country during the course of the tour, the McCartneys rented four houses in New York City, Dallas,Chicago, and Los Angeles. Each night, after the show was over, they would fly in a specially chartered BAC One-Eleven back to the nearest one of the rented houses. 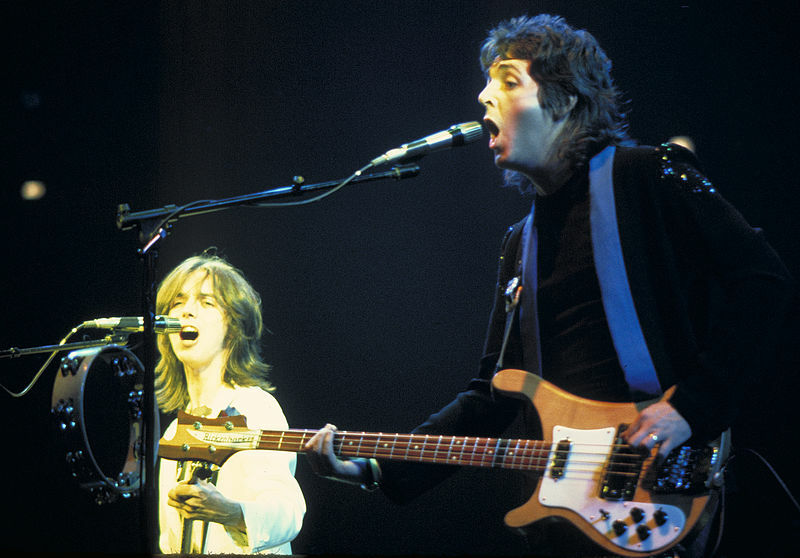 The beginning of the American leg of the tour was delayed for nearly a month because lead guitarist Jimmy McCulloch broke his finger during rehearsals. This led to more friction between McCulloch and the rest of the group, especially McCartney. A surprise was planned for one of the Los Angeles shows, and the fans in attendance were treated to the sight of McCartney’s former Beatles bandmate Ringo Starr joining him on stage and handing him a bouquet of flowers. Most of the concerts were professionally recorded at McCartney’s request. 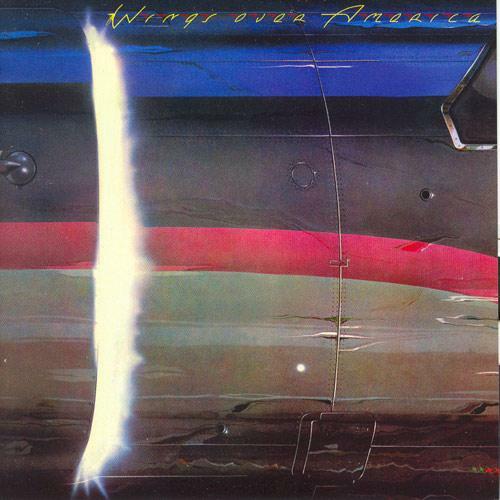 The best performances would later be compiled and released as a Christmastime triple album late in 1976, Wings over America. The album was very popular, reaching Number One in the US and Number Eight in the UK. A single was also released from the collection, “Maybe I’m Amazed”/”Soily”, a top ten hit in America and a top twenty hit in the UK. I will be the first to admit that this is a nostalgic choice, but when I revisited the album for this post, I must say it it is rather really good! And the bass sound is just fantastic, it’s a hymn to the bass guitar. 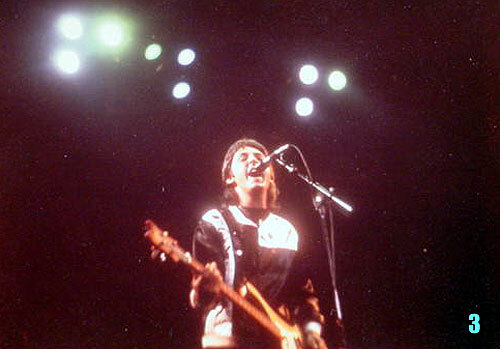 It is put in the front and McCartney plays melodies on his bass, not just a rhythm track. It reminds me quite a lot of the way John Entwhistle played. The sound on the videos posted here are not representative of the sound on the vinyls or the double cd.